A strong hit of molasses gives this sauce its deep sweet flavor that's paired with a tomato baste, a bit of vinegar, and slight smokiness to make a fairly standard supermarket staple barbecue sauce. If you don't know the Weber brand, god help you. The most iconic of grill manufacturers, Weber got its start as an ironworks company all the way back in 1893. They produced their first kettle grill almost 60 years later in 1952, and it turned out to be so popular that it later became the sole direction of the company. It'd be hard to imagine the American grill landscape without Weber, and they only seem to keep expanding. Beyond the seemingly endless models of gas and charcoal grills, they also have an offshoot company called Weber Seasonings that makes four different sauces along with rubs and marinades. The bottle boosts of "real molasses," and with one smell, you can be certain this is no false claim. Incredible deep with a molasses aroma, this sauce comes off as super sweet. It's almost all dominating, but the tomato is strong enough to have a presence, as well as a light vinegar tang. Continuing the molasses trend, this sauce has a thick consistency that's weighs it in solidly over medium on the scale. It has a maroon color with a glossy sheen. It's smooth texture is given a little body thanks to tons of spices that are clearly visible. Dropped from a suspended spoon, the sauce first falls in a large glob, followed by a couple smaller ones, and ending with a thick coating of sauce left clinging. The first taste is like taking a spoonful of sugar. 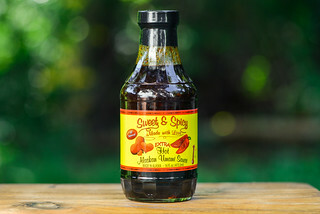 This overly sweet sauce starts to get some character as it settles on the tongue, happening first through the rich flavor of molasses, then by vinegar, whose tang starts to dampen the sweetness. Over time, the tomato base comes out and mixes pretty evenly with the sugar and vinegar. As the sauce starts to make its way off the tongue, a hit of garlic can be detected, along with a faint smokiness. The final flavor is a slight heat backed up by an increasing burn from the vinegar. The sauce clung to and coated the chicken well. It baked in nicely over indirect heat and developed some attractive caramelization over direct heat. The flavor still weighed heavily on the sweet side, but was much improved. The molasses was pumped up, giving it a more robust, rather than sugary, character. The vinegar tang was still present, creating a nice contrast to the sweetness. There wasn't much in the way of heat after being cooked, but I found the sauce to have a pleasing flavor even without the hit of heat I often enjoy. 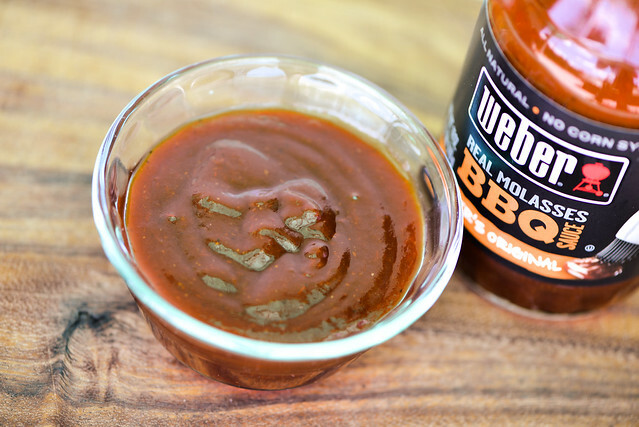 Weber's Original BBQ Sauce hits the sugar hard, with a deep molasses profile that seems to be fairly common among supermarket staples. 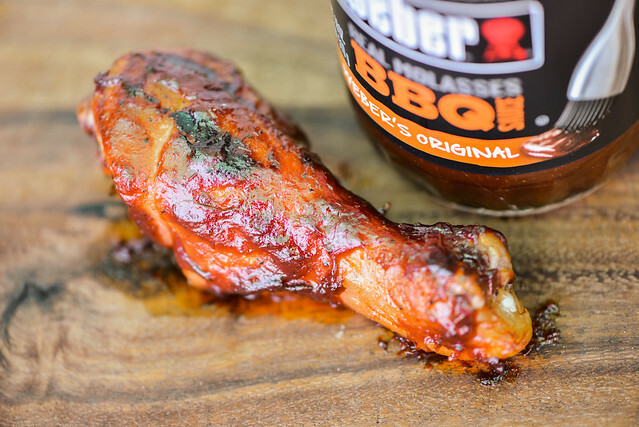 It's this affinity to other standard sauces that won't make Weber's really stick out in crowd, but it will still deliver a flavor that most will find agreeable. It's best suited for use on chicken or ribs, but would probably overpower a pile of pulled pork or freshly grilled seafood. 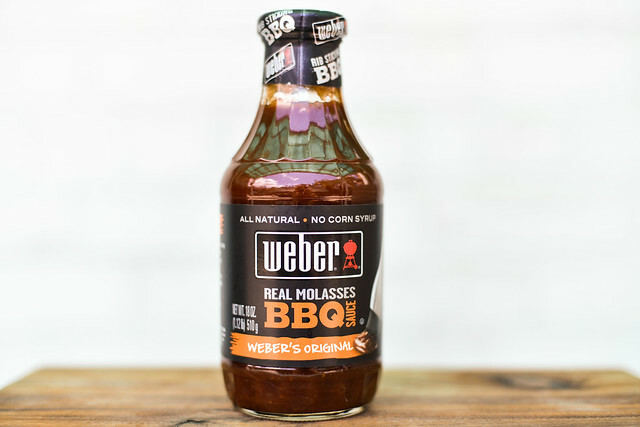 If you're looking for a sauce with decent sweet flavor, Weber will deliver, but it just won't wow. I really like the Weber dry rubs I have used, the Gourmet burger mix, Montreal seasoning, and Kick'n Chicken rubs all come to mind. I have not been as wowed by their sauces, like you. Not bad, just not great. While this isn't the best BBQ sauce in the land, I think it's worlds better than Sweet Baby HFC bomb's. It's much less sweet and has some good flavors. 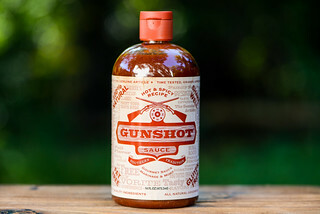 If I had to pick a readily-available (major market) sauce, this would be it. 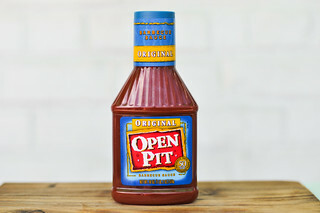 This is some of the best tasting BBQ sauce I have ever tried. I'm surprised by this review. At $2.47, this is by far the best non-fructose sauce I've tried among the mainstream grocery store variety. I don't have to doctor it, it's great out of the bottle. Balanced with a nuance of heat.